Do We Need These Probiotic Foods? Bacteria have a reputation for causing disease. So the idea of gulping down a few billion of them a day for the sake of your health might make probiotics seem (literally and figuratively), hard to swallow. But scientific evidence suggests that some illnesses can be treated and prevented with foods containing certain strains of live bacteria. The Indian population consumes a lot of these beneficial microorganisms called probiotics. These are similar to microorganisms found in the human gut. They are also called "gut-friendly bacteria" or "good bacteria". The tradition of eating foods fermented with bacteria, such as curd and buttermilk/lassi is common in our country. 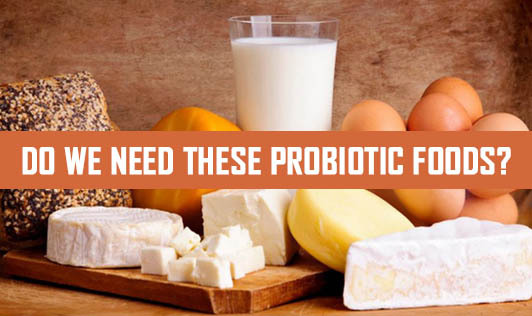 Using natural probiotic foods provides us with many health benefits such as improved immunity, decreased lactose intolerance especially in children, reduced inflammation, lowered chronic fatigue syndrome, and more. Nestle Nesvita Dahi: It contains around 100 crores of live bacteria in 100g of curd. Yakult (Probotic Drink): It contains over 6.5 billion of the bacteria Lactobacillus casei, strain Shirota. These products claim to provide the same benefits as curd or buttermilk/lassi. So should we start including such probiotics in our diet? Definitely not! As of now we do not know the long-term effects or benefits of consuming probiotic supplements. As for probiotic ice-cream, even though the manufacturers claim that this ice-cream would have 50% less fat, it still contains a good amount of fat. This can mislead an overweight person (one who is trying to lose weight) and tempt him/her to eat the ice cream which not only has fat but also sugar. There are better ways of getting probiotics than through ice cream. Probiotic supplements may be useful in hospitalized patients with intestinal problems, people who cannot eat normal food like us. Our ancestors and now science have already proved that buttermilk or lassi when regularly included in the diet can be highly beneficial. Regular consumption of curd/buttermilk is more than sufficient to keep your gut working well. So now it is time for you to decide whether you wish to opt for a healthy refreshing lassi or a probiotic supplement.